1. Heat 1 tbs of olive oil in a pan over a medium heat, add bacon and cook, stirring occasionally, for 5 minutes or until browned. Remove pan from heat and drain bacon on paper towel. 2. 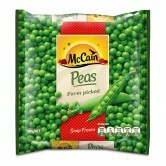 Place McCain Peas and all salad ingredients into a serving bowl and toss well to combine. 3. Whisk olive oil with lemon juice, white vinegar, Dijon mustard and finely chopped mint leaves. Season with salt and pepper and toss gently through salad. 4. 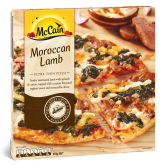 Serve McCain Pea, Lentil and Bacon Salad with your favourite McCain’s Pizza, we recommend McCain Ultra Thin Moroccan Lamb Pizza. 1 Heat 1 tbs of olive oil in a pan over a medium heat, add bacon and cook, stirring occasionally, for 5 minutes or until browned. Remove pan from heat and drain bacon on paper towel. 2 Place McCain Peas and all salad ingredients into a serving bowl and toss well to combine. 3 Whisk olive oil with lemon juice, white vinegar, Dijon mustard and finely chopped mint leaves. Season with salt and pepper and toss gently through salad. 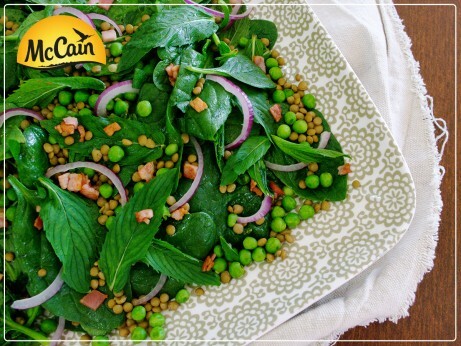 4 Serve McCain Pea, Lentil and Bacon Salad with your favourite McCain’s Pizza, we recommend McCain Ultra Thin Moroccan Lamb Pizza.